Bringing about innovation through design Aesthetics to create the ideal city. Urbanization is a new phase in the development of contemporary culture. Nowadays the main goal of countries around the world is without exception urbanization, or the perfection of it. Of the many factors with an impact on urban development, “design” is one of the most important. Design not only transforms daily life through “material” mass consumption but also builds a behavioral social mechanism through the building of a “system of things”,changing the face and character of a city. The theme of this year's exhibition is the“Aesthetics City” .This theme involves advocating the use of design to realize more creative lives and the use of aesthetics to build an ideal city. Aesthetics is the most distinctive conceptual link between a city and its design. The “Aesthetics City” exhibition takes a critical focus on issues encountered during the process of urbanization, such as suburban urbanization , counter urbanization.The exhibition explores urbanization models which allow people to live in harmony with nature and which allow both rural and urban areas to prosper. The exhibition will showcase innovative and inspiring examples from many dierent regions to locals and visitors, bringing with them new design and life concepts. 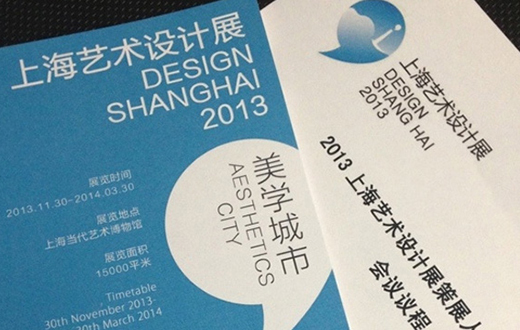 This will then spur Shanghai's development as well as China's art design and creative industries.